If you or your business partner used your home for business purposes during your financial year, you can claim 100% of expenses that are solely for business purposes e.g. a business phone line. For the rest, you can claim the proportion of your house that you use for work. When you use an area of your home for your business, e.g. your study or garage, you can claim a portion of the household expenses, e.g. rent if you are renting the home. You must keep invoices for these expenses. For example, for a house that is 100 square metres with an office of 10 square metres, the office takes up 10% of the total area. So, you can claim 10% of expenses not solely for business, e.g. a power bill - see here for a visual example. Any detached structure, such as a greenhouse, shed or detached garage etc. shouldn’t be included in the total house area - unless of course it's part of your workspace. Whatever you claim, remember to keep a record of each item. You’ll also be likely complete our home office claim spreadsheet, which you can email info@rightway.co.nz and ask for a copy of. 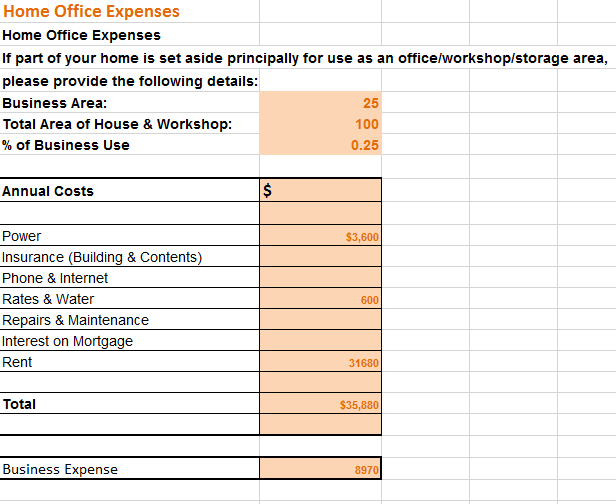 When using this spreadsheet, enter how big your office work space is and then the total area of your house and workspace, which will then calculate what percentage you can use for a business expense. Then add your annual costs below to calculate your total claim.